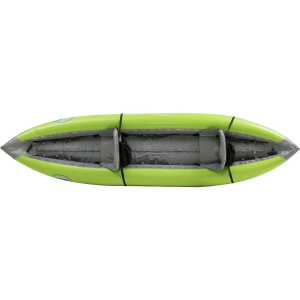 AIRE Lynx II Tandem Inflatable Kayak - The tandem Lynx II inflatable kayak from AIRE is a tried and true all-around river runner made for two. The Lynx offers stability, control and maneuverability all in one kayak. The Lynx can handle big water, creeks and your local river sections. The continuous curve design give you a fast hull speed and quick responsiveness. Self-bailing drain holes keep the performance level high in bigger water. PVC-coated tubes and floor provide superior durability, and airtight internal bladders provide an extra measure of strength and safety. The adjustable Cheetah seats feature a stiff backrest with a large storage pocket and bottle holder and easy clip in points. It can also double as a comfy camp chair. The Lynx II can be set up as a solo kayak for extra cargo room on multi-day trips. 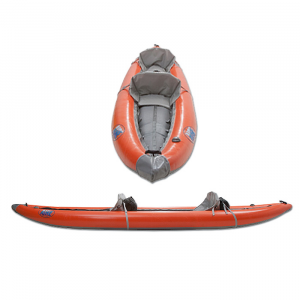 An excellent choice for all paddlers, the AIRE Lynx II inflatable kayak gives beginners the confidence to navigate the river and experts the room they need. The Aire Lynx II Tandem Inflatable Kayak rides up and over waves, cruises through tight and tricky sessions, and plows through holes to be one of Aire's top performing tandem river runners. 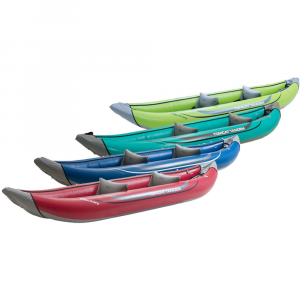 Its designed for day trips with your paddling partner or for solo extended river trips through foam and flats. The removable and adjustable seats and cargo loops allow you to customize the craft for whatever adventure is in store for you. The basics of this boat are two PVC tubes filled with three AIREcell air chambers on each side. PVC weathers the wear and tear of high volume rapids or low-flow rock runs. The combination of robust fabric and rigid rails allows the Lynx II to have high stability and control. Its Leafield B7 valves only let air flow one way, meaning flipping in the middle of a raging river still won't cause these super-sealers to leak. Finally, the self-bailing floor sheds water before water-logging your gear. 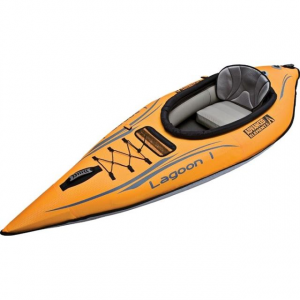 AIRE Lynx II is a tandem inflatable kayak that can easily be paddled solo. 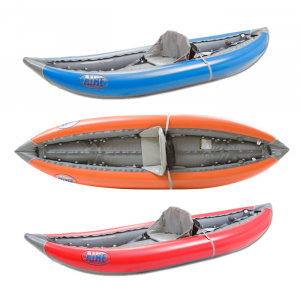 AIRE's best selling kayak features a hull that is quick and responsive. Weighing 43 lbs., the unique design makes this kayak light and maneuverable. An airtight urethane cell is zippered into a PVC outer skin providing abrasion protection. The Lynx is self-bailing for high performance and dependability.Features: 2 carry handles 3 sets of drain holes 17 sets of cargo loops 2 Cheetah chairs Specifications: Length: 12'-6" Width: 39" Weight: 43 lbs. 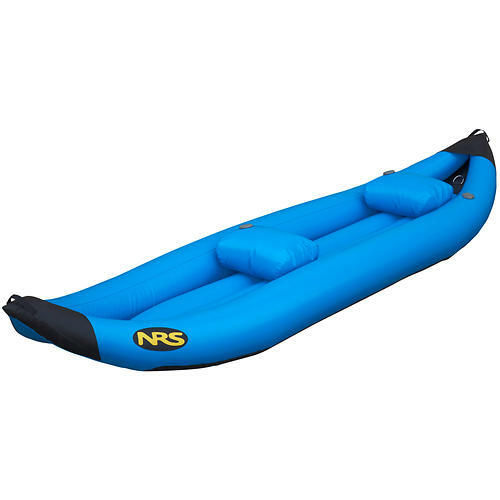 Tube Diameter: 11.5" Center Compartment: 16" Bow\Stern Rise: 15" Waterline: 91" Number of Air Chambers: 3 Valve Type: Leafield B-7 Base Fabric: 1100 Material Weight Oz/Yd: 24/27 Thwarts: 0 Load capacity: 475 lbs Warranty: 10 Year Retail, 5 Year Commercial FREE Electric Pump!! A $100 Value Included in the price of the kayak is the NRS Blast Inflator Pump ,an awesome little 12-volt electric pump capable of inflating your kayakto 2psi. It easily clamps to your vehicles battery with the 12-footpower cord, and with the included adapter youll have no troublefitting a wide variety of valve types. 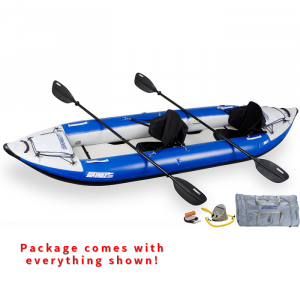 This is a $100 value, yoursfree with the purchase of a Tributary Aire inflatable kayak.